One of the post-move necessities for any WordPress webmaster is to make sure all images and links direct properly. During the move phase the site URL is adjusted to change the location of the website and allow access to the WordPress dashboard, but internal links are not changed which means they may be broken after the move. 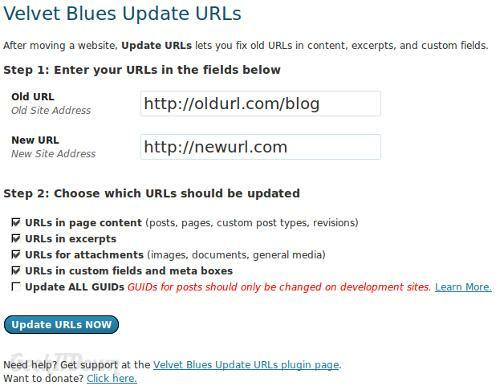 To fix internal links and image paths, users can run the Velvet Blues Update URLs plugin after the WordPress move is complete. The plugin makes the process very easy and painless. Here’s how to use the plugin successfully. Warning: Link structure must be maintained in order for this process to function properly. 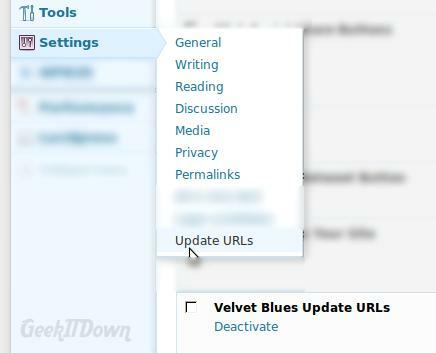 Example: If during your WordPress move your URL was changed to yourdomain.com (without the www), then the new URL in Velvet Blues Update URLs must be entered without the www as well. Under plugins, click “Add New”. 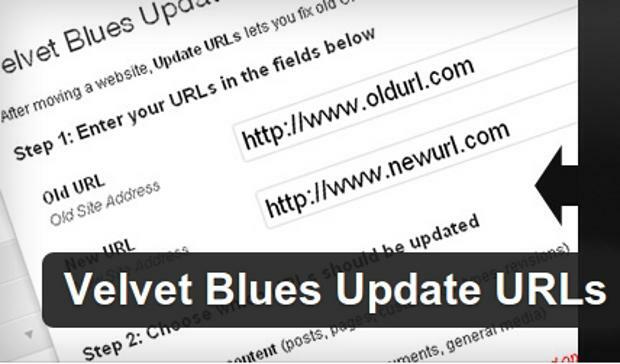 Search for and install the Velvet Blues Update URLs plugin. Under Settings, click “Update URLs”. In the site address fields enter your old URL and new URL in the appropriate boxes. Example: If moving your WordPress blog from /blog to root(/), the fields would read as shown in the image below. Check off the first four boxes under the URL address fields. Note: Checking the first four boxes is typical for most users. If you have a unique setup, then you may need to adjust those options accordingly. When Velvet Blues Update URLs is finished you will receive a success message with some details about the number of links changed, etc. It’s important that you test your links. It isn’t necessary to test every link obviously, but you’ll want to check a bunch of different post links and images to ensure everything is working properly. Changing links on a wide scale like this can be unpredictable, though for the most part successful. Here are some things to check if your link changes don’t work as expected. You’ve just changed your entire link structure so if none of them appear to be working, be sure to empty out your cache and cookies. Then test them again. Updating URLs has to be precise. If links aren’t directing properly, double-check that the URLs entered are accurate. See warning above. Velvet Blues Update URLs isn’t the only option, so if no matter what you do the links still don’t change properly or at all, you can try Search and Replace as an alternative. If all else fails and plugins won’t work, you can manually edit the database file to reflect the changes. Open the .sql file in a text editor and replace references to the old URL with the new URL. Save and restore the database. Note: Again, you must be precise. Replace the entire URL to ensure it is done properly.